Our Charlotte skirts are fast approaching the finish line, folks! Today we'll be showing you how to attach the waistband flawlessly, and finishing the flap fastening. If you need to catch up, look at the previous Charlotte skirt sewalong posts. Ok guys, let's get to it. 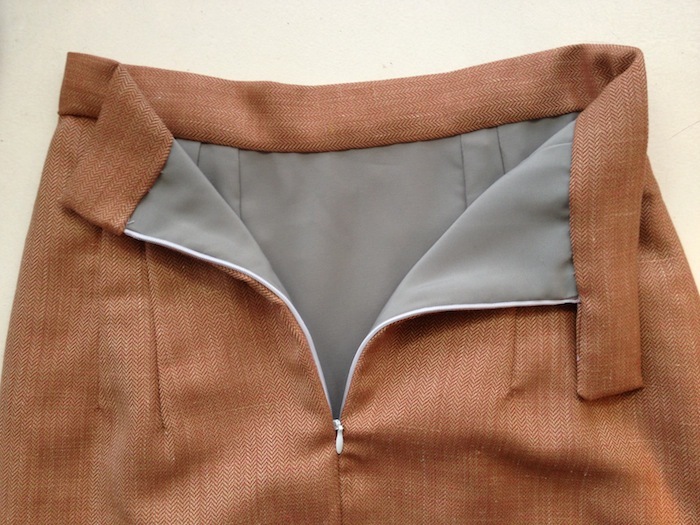 With right sides together, fold your waistband in half lengthways. Stitch one end shut and the other end in a sort of reverse "L" shape, stopping at the point marked "centre back" on the pattern. This will form the fastening flap. 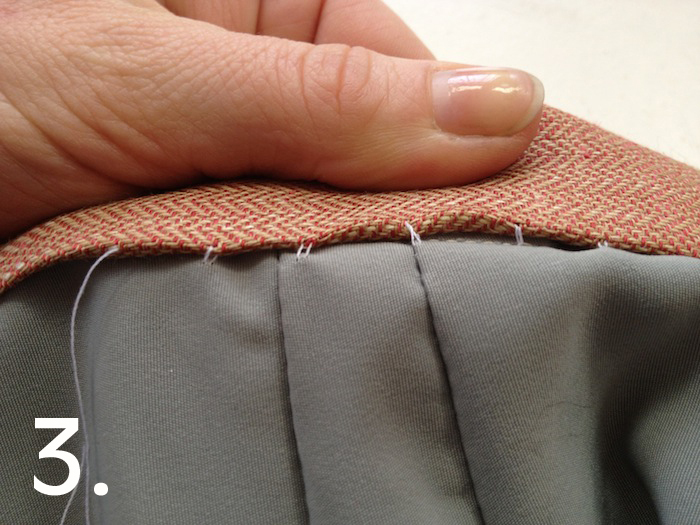 Trim the excess seam allowance, turn to the right side and press the entire waistband, as shown below. 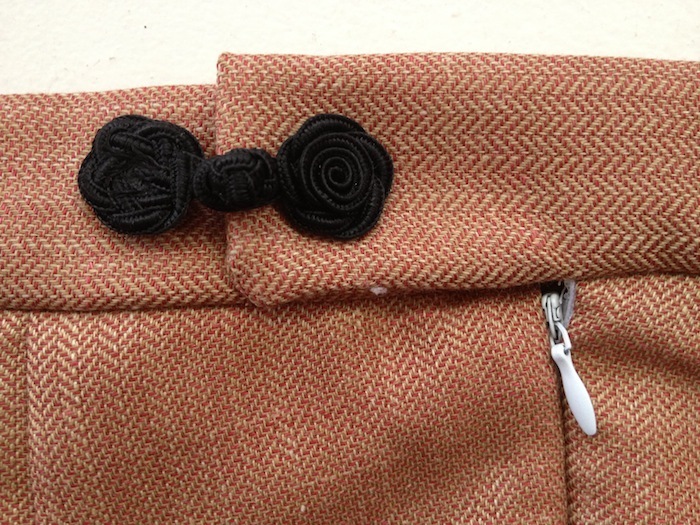 Open up the waistband and pin one of the raw edged lengths to the waistline of the skirt, right sides together, as shown below. Bear in mind that the waistband has 3/8" ease to accommodate the peplum, so if you're making either the plain or ruffle-hem variations, you might need to make up for that by stitching the non-flap end of the waistband with a full inch seam allowance as opposed to the recommended 5/8". The best way to make sure you get a perfect fit along the waistline is to start pinning your waistband at the flap end, and any extra length at the other end can be easily adjusted without having to repin the entire thing. 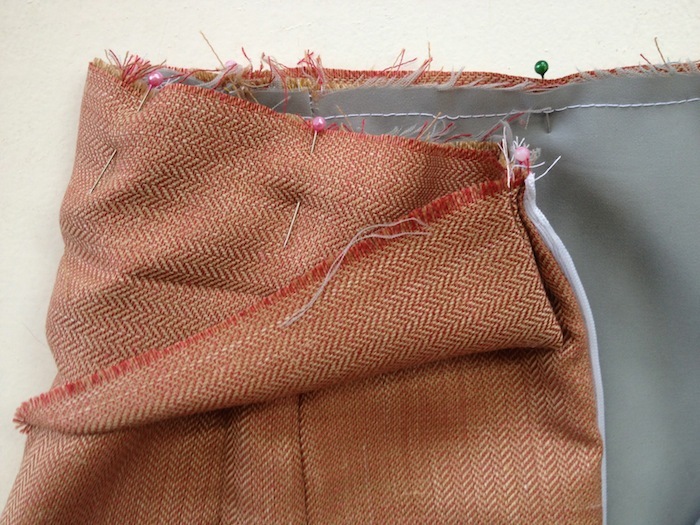 Once you're happy with the waistband pinned to the waistline, machine stitch into place. 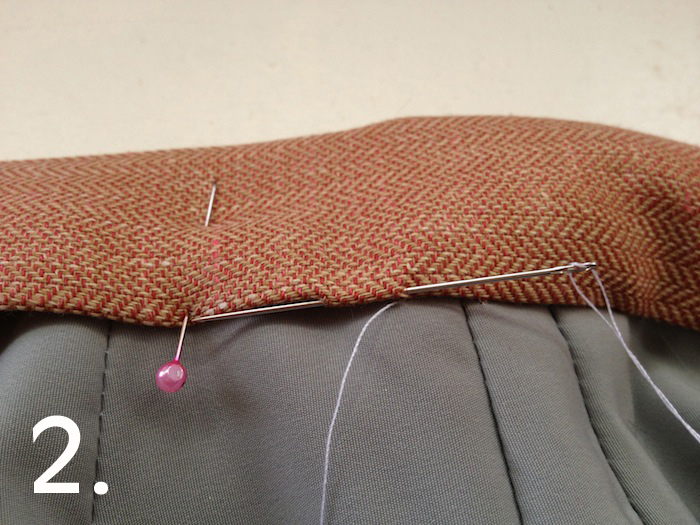 Press the seam allowance up into the waistband. Now press the seam allowance of the remaining raw edged length inwards and pin it in place inside the skirt along the waistline, thereby sandwiching the raw edged seam allowance at the waistline of the skirt. Time to put the kettle on. Or pour yourself a whiskey - but only if you're already a confident blind stitcher and you are, in fact, of age to be sippin' & sewin'. If you've decided to add a lining to your Charlotte skirt, you'll remember us taking you through the motions of blind stitching. If that's all news to you, fear not, we're gonna do it again. We just can't get enough. Thread up your hand sewing needle with a length of thread about 5" longer than your waistline measurement. Knot one end securely a good few times. 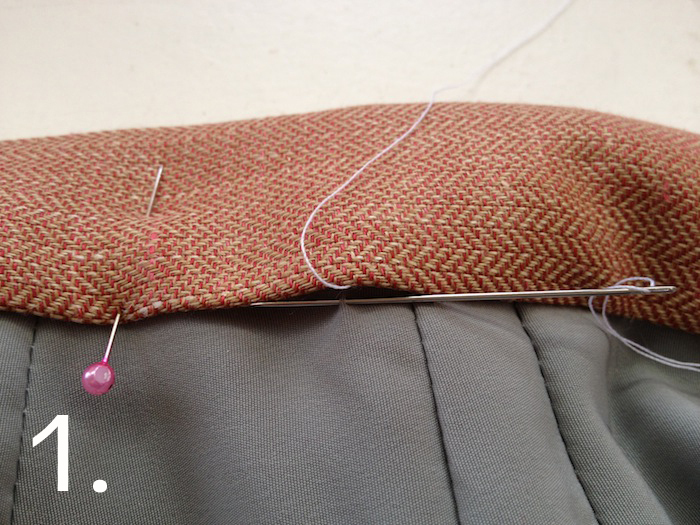 Use your needle to pick up a few strands from the lining fabric (or the main fabric of the skirt if you are omitting the lining), and pull the needle through (fig.1). Reinsert the needle into the pressed edge of the waistband directly above the point at which your needle just came out (fig.2). Using the pressed fold as a guide, slide the needle an centimetre or so along inside the fold and then come out again. Keep repeating figs. 1 & 2 the entire length of the waistline and securely knot off your stitching at the end. If you gently pull back the waistband you'll see lots of tiny, evenly spaced stitches, that invisibly secure the inside of the waistband (fig.3). Look at that for a crispy finish. Just one post left to go - sniff - in our first ever official sewalong! We'll be back before the weekend with all things hem. We'll be going over three different hemming techniques, showing you how to add a back split for added walkability and showing you how we did that dipped hem ruffle mini... Do you dare? 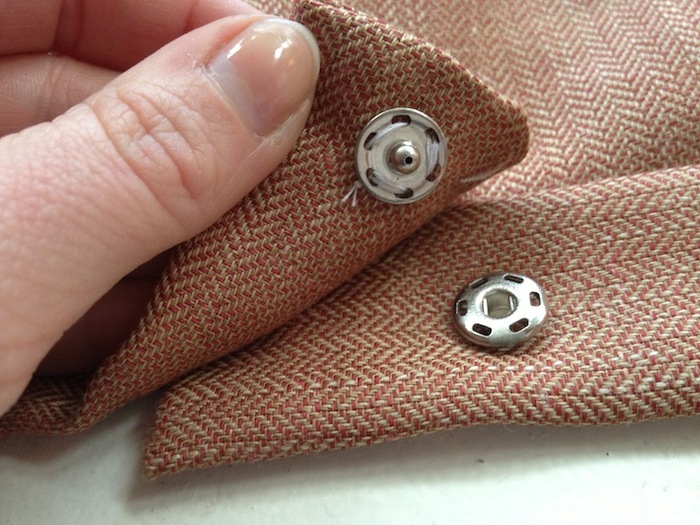 Great blog and sew-along, I really needed to be reminded of the steps. Ending with a useful tip for excellent results; press, press and press(where expected) – during the whole work process. Glad you’ve been enjoying it! In terms of the hook – do you mean a kind of bulky oversized version of a hook and eye? If so, you could try sewing it on to the outside of the flap (like we did with the black fastening) making it into a decorative feature! Sew the hook to the outside of the flap just on the edge so it hooks on to the bar right there. Does that make sense…? Thanks so much. That really helps. I agree that they can be a bit crunchy. 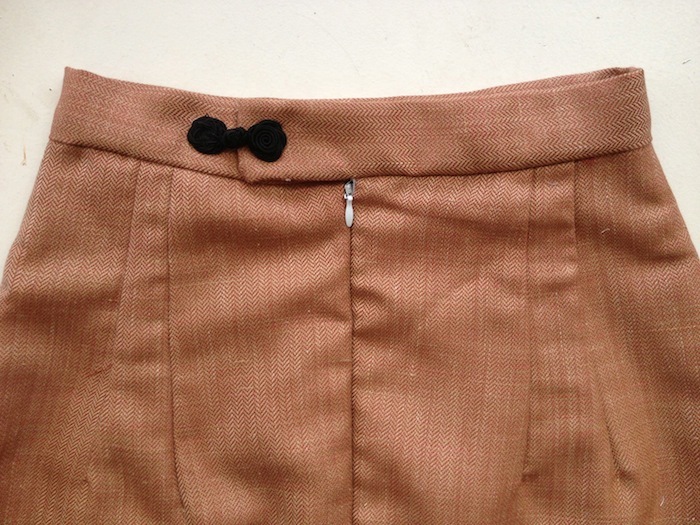 Oh, I love the decorative closure on the waistband…what a cute detail! Hi, Would you recommend putting some interfacing in the waist band to make it stiffer? I’m using a linen and wondering whether or not I should bother ‘stiffening’ it a bit? We here are not fans of interfacing. If you are using a very lightweight linen and making the waistband wider, then it might be wise to add interfacing (but avoid fusible if you can as we feel it gives a distinct ‘crunchy’ feeling…) but if you’re going for the given slim waistband and your fabric is slightly heavier than quilting cotton, I wouldn’t really bother with interfacing. 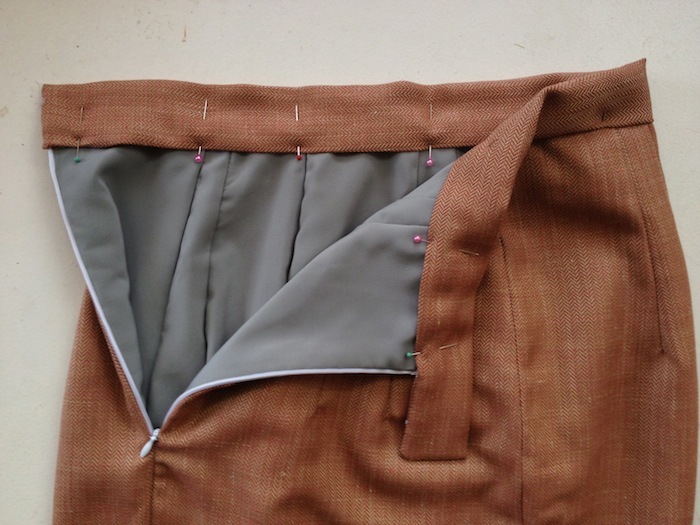 This is, however, a personal choice – if you feel like your waistband is a little flimsy then definitely stitch in a layer of interfacing (or you can use the same linen you’re using for your skirt if you don’t have interfacing) – but only one layer applied to half the width of the waistband – so altogether when folded in half lengthways you have 3 layers. Hope this helps! Hi Guys, I second the sewalong pace. It’s been great not to be rushing through. Now I’m really itching to wear my skirt! I have used a trouser/skirt hook and bar on my closure and it doesn’t really lie as flat as I would like. Is there a way in which it can be sewed so that it looks flat and neat without the ends sort of popping up? I hope that makes sense?